Sign up for the latest contest or giveaway from Gaming-fans.com. From Star Wars themed apparel to movie and gaming giveaways, Gaming Fans has you covered with cool contest and prizes. Sign up below with your name and a working email address (it has to work for us to notify you!) and you are eligible to win prizes from our most current contests. 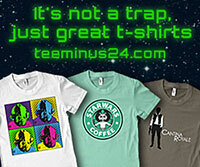 Our first giveaway will be a Star Wars themed t-shirt from TeeMinus24.com. Enter your name and (working) email address below to be eligible to win*. The first free tee giveaway will be announced in CubsFanHan’s next Star Wars Galaxy of Heroes YouTube video, expected to be released the week of November 6th. One t-shirt will be given away each week through Christmas. * No purchase necessary. Enter your name and email address to be eligible. If your email does not work or you do not respond within five (5) days your prize will be forfeited and given away to another lucky winner. Emails collected will only be seen by Gaming-fans.com and their select partners.